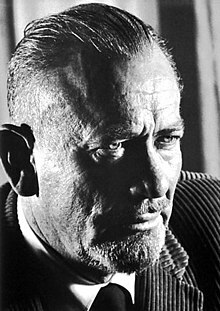 John Ernst Steinbeck, Jr. (Februar 27, 1902 – December 20, 1968) wis an American author. He wan the 1962 Nobel Prize in Leeteratur "for his realistic an eemaginative writins, combinin as thay dae sympathetic humour an keen social perception." He haes been called "a giant o American letters," an mony o his warks are conseedert clessics o Wastren leeteratur. In his writin career, he authored 27 beuks, includin 16 novelles, sax non-feection beuks, an twa collections o short stories. He is widely kent for the comic novelles Tortilla Flat (1935) an Cannery Row (1945), the multi-generation epic East of Eden (1952), an the novellas Of Mice and Men (1937) an The Red Pony (1937). The Pulitzer Prize-winnin The Grapes of Wrath (1939) is conseedert Steinbeck's masterpiece an pairt o the American leeterar canon. In the first 75 years efter it wis published, it sauld 14 million copies. Maist o Steinbeck's wark is set in central Californie, pairteecularly in the Salinas Valley an the Californie Coast Ranges region. His warks frequently explored the themes o fate an injuistice, especially as applee'd tae dointrodden or iveryman protagonists. ↑ The Swadish Academy citit The Grapes of Wrath an The Winter of Our Discontent maist favorably. ↑ "Nobel Prize in Literature 1962". Nobel Foundation. Archived frae the oreeginal on October 21, 2008. Retrieved October 17, 2008. ↑ "Who, what, why: Why do children study Of Mice and Men?". BBC. Archived frae the oreeginal on January 7, 2015. Retrieved December 6, 2014. ↑ "Novel". The Pulitzer Prizes. Archived frae the oreeginal on August 21, 2008. ↑ Bryer, R. Jackson (1989). Sixteen Modern American Authors, Volume 2. Durham, NC: Duke University Press. p. 620. ISBN 978-0822310181. ↑ Chilton, Martin. "The Grapes of Wrath: 10 surprising facts about John Steinbeck's novel". Telegraph (London). Archived frae the oreeginal on December 13, 2014. Retrieved December 6, 2014. This page wis last eeditit on 8 Dizember 2018, at 17:43.